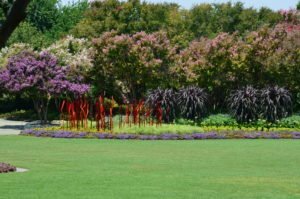 PLEASE STOP PLANTING CRAPE MYRTLES!! 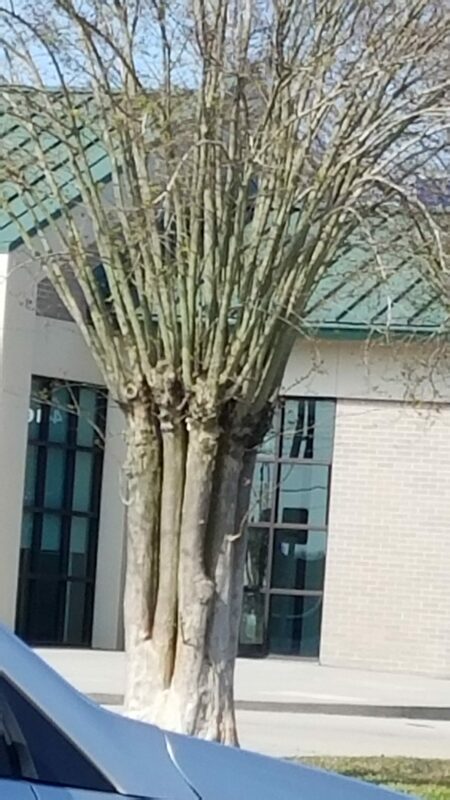 The way crape myrtles look in February and March is a travesty (a distorted representation of a tree) and a tragedy (an event causing great suffering destruction and distress) to the individual plants. To what am I referring, but the way the trees get brutally whacked and chopped by loppers and saws, and then get loaded into a large trailer adding to the landfill!! 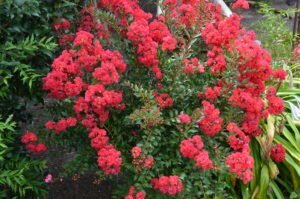 If they are too tall, pull them out and plant shorter varieties, but Crape Myrtles rarely or never need pruning. Crape Myrtles are TREES and that means they grow TALL from 20 – 40’ in height. They have been lovingly referred to as the Lilac of the South (with no fragrance) with a very long bloom time in the summer. 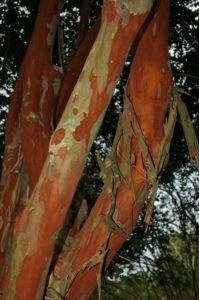 Crape myrtles have wonderful exfoliating bark in late spring/early summer that as a kid, I loved to peel off the trunk to reveal a beautiful, velvety, cinnamon colored trunk. The leaves also provide great fall color from yellow to orange to red if the weather cooperates. So here we have a plant that give us an exceptionally long summer bloom period, great fall foliage (not many trees do that here) and a beautiful sculptured trunk when allowed to grow naturally. There are two types of Crape Myrtle frequently planted; there is Lagerstroemia indica and Lagerstroemia hybrid (indica x fauriei). The first species L. indica has small round leaves and is terribly susceptible to powdery mildew which is a white powder that causes the leaves to curl up and distort, stops photosynthesis and occurs in spring AND fall. Powdery mildew must be sprayed with several fungicide applications OR you can plant the National Arboretum Hybrids which are totally resistant to powdery mildew. The Hybrid Crape Myrtle, Lagerstroemia indica x fauriei, (Indian Tribe Hybrids and named so) was started by Dr. Donald Egolf of the National Arboretum beginning in 1959. He started a research project to develop disease resistance (powdery mildew), hardiness (because fauriei species was more frost tender that indica) rebloomers, true flower color and unique inheritable dark trunk colors. The hybrid crape is easily distinguished from the species as it has larger rectangle leaves, larger flowers and flower clusters and is totally resistant to powdery mildew – never spray fungicide again! If you do not have the space for a 20 or 30 foot tree try using one of the shrub or dwarf varieties. 1) Do not plant in the flower beds next to the house; INSTEAD use a tall variety in the middle of the yard to provide summer shade on the west side of the house. 2) Crape Myrtles are either single trunk or multi-trunked and it can take a long time to turn a multi trunk into a single trunk, so purchase single trunk to begin with if that is what you need. 3) Plant the hybrids with the large leaves to avoid powdery mildew in the spring and fall. 4) Crape Myrtles need at least 6 hours of DIRECT SUN for good, long summer bloom. 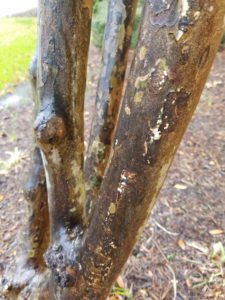 5) Watch for Crape Myrtle Asian Bark Scale, it turns the trunks completely black and must be treated systemically and topically. Severe pruning seems to attract these sucking insects. 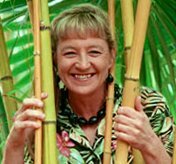 Finally, you be the teacher and help educate those holding the chain saws and pruners to stop the horrible disfiguring of our beautiful sculptured trees and know, no pruning is necessary if the trees have never been pruned. 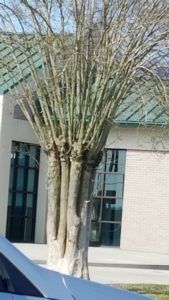 Did you mean to say please stop PRUNING crape myrtles?